A family dentist sees you and your family through all walks of life, from tending to your child’s first tooth to helping grandma find dentures that work for her. That’s why it’s so important to choose one that you can trust. At Kalamazoo Smiles, our family dentist is happy to work with patients of all ages. Here are some tips to consider when looking for a new dentist for yourself or your family. Will your insurance cover this dentist? One of the main reasFamily Dentistons people switch dentists is when their dental insurance changes. Having an in-network dentist can mean the difference between paying all or none of the cost of a teeth cleaning. Asking if a dentist accepts your insurance is not the same as asking if they are in your network. If a dentist accepts your insurance, this means that they are willing to simply send the bill to your insurance company. If a dentist is in your network, this means that your insurance company has agreed to partially or completely pay for dental services received from that dentist. Is this dentist conveniently located? We recommend choosing a new dentist that’s close to home or work. That way, you won’t have to travel long distances for a dental emergency or in bad weather. It’s much more convenient to have your new dentist located nearby. You’ll also want to check the office hours to see if they work with your schedule. For example, it’s not uncommon for dental practices to have fewer office hours on Fridays. How much experience does this dentist have? How long has the dentist been in practice? If they have recently gotten out of dental school, you may want to keep looking for a dentist with more experience and knowledge of the latest dental technologies. You’ll also want to ask about what kinds of family dental services they offer and their level of experience with each. For example, if you are looking for a smile makeover dentist, you’ll want to look for someone with experience in professional teeth whitening, porcelain veneers, and other cosmetic dentistry services. Make sure any dentist you consider has all the training and clinical experience needed to perform cosmetic dentistry procedures. What dentist does your family or friends recommend? If your friends and family live in the same area as you, you may want to ask them who they trust to be their dentist. While you can always check online reviews, family members tend to be more trustworthy than strangers on the internet. From personal recommendations, you’ll be able to get more information than if you just looked on the dentist’s website. If a dentist accepts your insurance, a family member may be able to tell you if the dentist is professional or rude. If you are looking for a cosmetic dentist, they may also be able to tell you about the quality of the dental restoration and the level of care they received. At Kalamazoo Smiles, we know that choosing a new family dentist is an important decision. 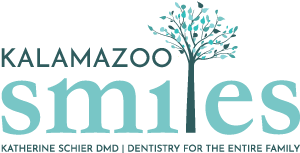 Our Kalamazoo, MI family dentist is confident that when you choose our office, you’re in good hands. To set up an appointment, give our office a call at (269) 353-3700!